Split is an urban, cultural and traffic center of Dalmatia. 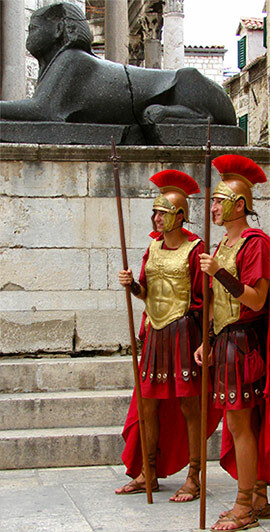 Split it with a 1700 years, a variety of archaeological, historical and cultural monuments, among which occupies the famous Diocletian's Palace, which is the essence of the present city of Split, a part of world heritage by UNESCO, has appeal, warmth and modern Mediterranean city. This is the eternally young city that lives for its slow pace that can easily adapt to. The first inhabitants of this city was the Emperor Diocletian, who was ordered by now famous Diocletian's palace. Apart from the Diocletian Palace in Split, there are numerous historical monuments such as the Iron Gate Golden Gate Silver Gate, Brass Gate, the Cathedral of St.. Duje, peristyle, basements vestibule, the Benedictine Monastery of St.. Chapel of St. Euphemia. Martin over the Golden Gate, a late antique church of Sv. Theodore above the iron gate and many other cultural monuments. - Diocletian's Palace, Split – It was built by Roman emperor Diocletian around 295 and he spent the last years of his life in it. Gradually, the city of Split developed around and within the palace walls. - St. Dujam's Cathedral, Split – It was built on Emperor Diocletian's mausoleum. An Egyptian sphinx from the 2nd century BC lies at the very entrance to the cathedral, and the other is situated near the St. John’s church –Jupiter’s temple. - Ancient Salona, Solin – The remains of the ancient town of Salona, the capital of the Roman province Dalmatia. Present-day Solin still holds the preserved remains of the arena, the spas and many other localities of ancient Salona. - Klis fortress, Klis – The fortress is situated above Split and it protected the city from Turkish attacks. - St. John's Cathedral, Trogir – The cathedral contains the famous Romanic portal made the great Croatian sculptor, Master Radovan. - City walls and the Kamerlengo fortress, Trogir – Medieval walls date back from the 14th century and the fortress used to house armies. Today in the fortress you can find a summer stage and a memorial park. - The Cetina river, Omiš – slow and paced rapids, refreshing lakes, Mediterranean vegetation, unexplored caves and recreational activities are the main reasons why this river attracts numerous tourists. - Marjan city park, Split – This Mediterranean vegetation park above Split offers a spectacular view of the sea and the Split promenade “The Riva”. - Kastela Crljenak – autochthonous wine sort which was taken to The United States of America in the 19th century, and is cultivated there under the name of Zinfandel. Visit the 1700 year old city, go back in time with Diocletian’s evenings in the basements of the palace, be a part of the festival atmosphere of the authentic Dalmatian song in Omiš and Kastel Kambelovac or enjoy concert evenings and other events that take place within the ancient walls. You will find numerous restaurants and cafes for pleasant socializing on the rivas in Split and Trogir and in the city centres. Head to Split's surrounding area and be sure to check out Sinj's Alka – a knights' competition traditionally held on the first Sunday in August in the honour of Sinj's victory over Turks in 1715. If you wish to go back even further in time, to the Stone Age, visit the Kremenko (Flintstones) Tavern in a cave above Omiš, in a small village called Svinišće. In all small towns on the Split Riviera fishermen's festivities and many restaurants for everyone's taste will welcome you, and young people can have fun in discothèques and night clubs in Split, Trogir and Omiš.